Four students and a faculty member from Illinois State University’s School of Kinesiology and Recreation traveled to Russia for a 17-day, short-term study abroad experience. Traveling to Russia were Travis Howe, Kevin Neylon, Caitlin Fortier, and Kayleigh Price, along with Instructional Assistant Professor Karen Dennis. The group flew into St. Petersburg and spent a weekend exploring the sites of this former Russian capital city, including St. Isaac’s Cathedral, the Hermitage (former Winter Palace), an excursion to Pushkin, just south of St. Petersburg, to see Catherine’s Palace (the Summer Palace), and another excursion to Peterhof Palace, located on the southern shore of the Gulf of Finland. A 12-hour overnight train ride from St. Petersburg to Vladimir was an exciting experience in itself. Upon arriving in Vladimir, the group was met by hosts from Vladimir State University’s Institute of Physical Culture and Sports. The next 10 days were spent visiting classes, laboratories, sports facilities, hospitals, clinics, and schools, in addition to touring training facilities (Greco-Roman wrestling, and powerlifting) and meeting many Olympic competitors and coaches that train in these facilities. The Redbirds participated in the “Last Bell” ceremony, which is similar to Illinois State’s commencement ceremony. They were also able to visit the very ancient city of Murom, where they visited a Vladimir State satellite college. School of Kinesiology and Recreation students with President Larry Dietz and Marlene Dietz in Russia. There were several other Redbirds in Vladimir at the same time—all staying at the same hotel. 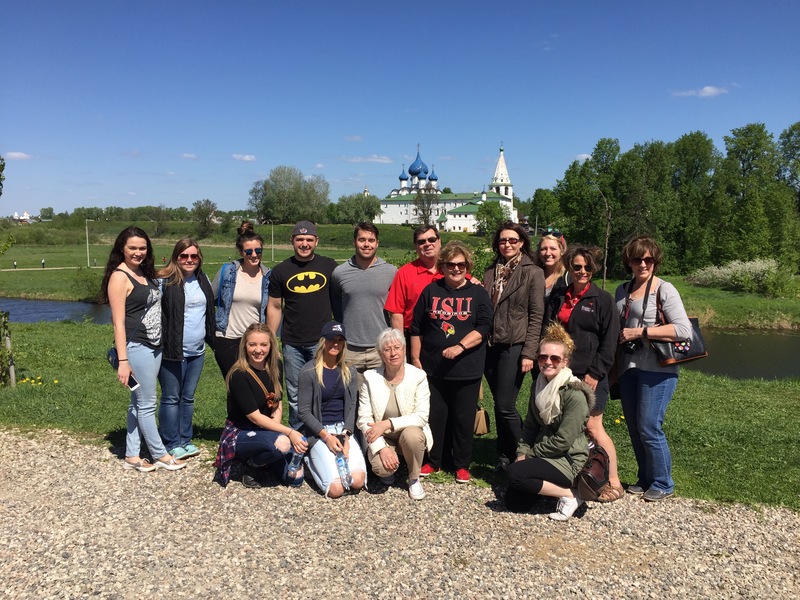 President Larry Dietz and Marlene Dietz, as well as students and faculty from Mennonite College of Nursing, joined the Kinesiology and Recreation group in Vladimir. Dietz gave a presentation to Vladimir State students and faculty. He also spent time with Vladimir State’s president and participated in our exchange activities. The Kinesiology and Recreation group had great opportunities for cultural immersion visiting several historical sites, many which are UNESCO World Heritage Sites. The Vladimir State University hosts provided a rich and broad range of cultural experiences, including attending a Russian concert, excursions to nearby villages and towns in the “Golden Ring” of Russia, tours of cathedrals and museums and, probably most memorable, having dinner in a family home. We all enjoyed the wonderful Russian cuisine, including freshly harvested vegetables from the families’ dachas. Following the wonderful experience in Vladimir, the Redbirds traveled to Moscow for two and a half days before flying home. They walked on Red Square, visited Lenin’s Tomb, and walked the city of Moscow! The travelers are most grateful to the Office of International Studies and Programs, the School of Kinesiology and Recreation, and the College of Applied Science and Technology for their support and assistance in the planning of this wonderful experience.